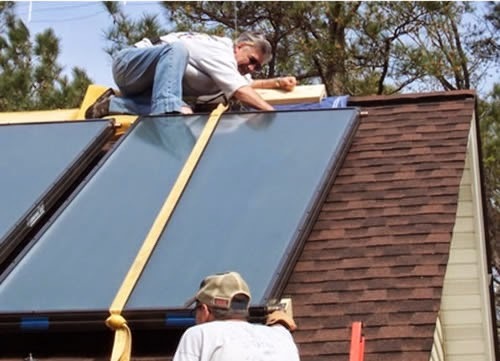 Chris and Brenda are looking for ways to control energy expenses through retirement and built this very nice and very high quality solar water heating system. While it is loosely based on the $1K design, it has a number of unique features that are aimed at achieving a long and maintenance free life. The system uses two AET 40 sqft commercial collectors to provide plenty of hot water and the potential for some space heating later. Using SRCC certified collectors has the advantage that the cost of the whole system will be eligible for the federal 30% tax credit. 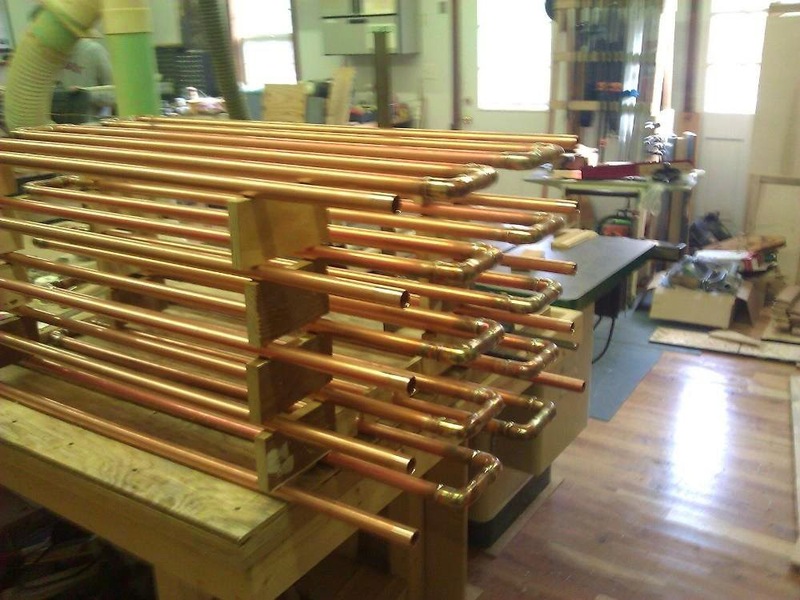 Chris built the single pass heat exchanger form 3/4 inch copper pipe using soldered elbows to provide a hundred ft of effective length. 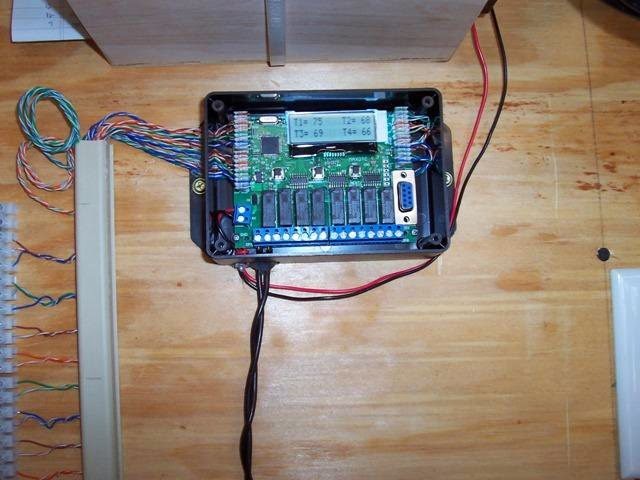 A MAXDTC controller was used to provide good control flexibility and to provide data logging for the system. Chris worked out a ramp arrangement to get the 150 lb collectors up on the roof. There is also a good description of the very nice mounting system. Ramp and sleds being used to move collectors up to roof. Retired heating service educator here. 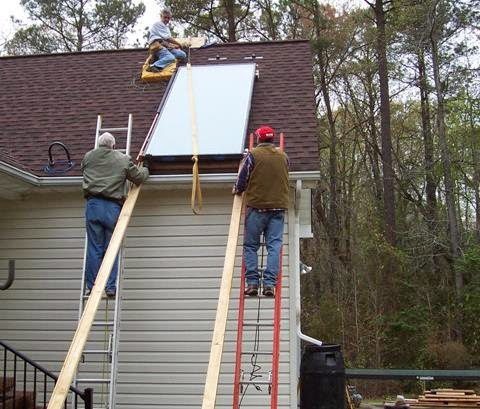 I have, in Minnesota a water heater that is 72 sq ft of panel with a 120 gallon tank, bosch system. I looked at your outputs and wonder as you ( I Think? ) should have outputs near mine, but your short! I'm wondering on your hex, what is the temp in verses out? I wonder as your flow verses tubing footage appears short, guessing about 30%. Here my well head water runs +/- 45 degrees into my solar heater tank, out is usually over 120. I like the tank and exchange you used, it's far simpler then mine but your tank being larger and running higher temps ( Mine max's at 140 ) I'd be looking for more from it. I also use warm air and photovoltaic here. Just a thought for you, my system uses just over 50 foot of heat exchanger per panel, I have 3 using 156 feet.